We are offering wide range of Humidification System for Textile Industry. These are widely used to meet the requirements of textile industries. The main usage of these plants is to help in the production of yarns for various garments. We are offering wide range of Humidification System for Textile Industry. These air washers are manufactured by our experienced engineers using excellent quality raw material and components in accordance with the industry laid standards & norms. 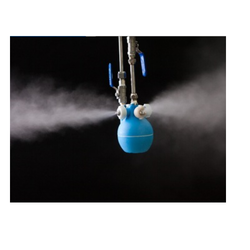 Looking for Humidification System for Textile Industry ?